Apple’s iPhone 7 and iPhone 7 Plus are now made available across all its stores around the globe. They come in various colors such as Rose Gold, Gold, Silver, Black, Jet Black. Three variants 32GB, 128GB and 256GB memory capacity phones provided for the buyers. iPhone 7 weighs about 138 gms and iPhone 7 plus weights around 188 gms. There is a variation in the screen size too. 7 has a 4.7-inch screen with 1334×750-pixel resolution at 326 PPI, and 7 plus has a bigger screen of 5.5-inches with 1920×1080-pixel resolution at 401 PPI. Besides these, there are no much differences that exist between the two models. Features and specifications remain same. 12-megapixel camera wide-angle ƒ/1.8 aperture and telephoto ƒ/2.8 aperture cameras with optical zoom at 2X and digital zoom up to 10x provide good quality of pictures and videos in low light conditions. The camera clarity is focused more this time by the iPhone developers while launching these models. As per the expectations of the users, high featured camera phones are made available for the users. The low light and the stabilization of the picture while taking the photos and videos are explained through an official ad for the company too. The enclosure is Splash and water resistant which makes the new iPhone 7 and 7 Plus different from its previous models. The uni-body design is also helpful in this concept of protection against water. One of the primary ads that are aired by Apple depicts this feature with proud. The design is entirely re-engineered to have a new look and support the water resistant feature. Apart from the smartphones, Apple also launched a smart watch with the latest operating system. In this regard, the official website has an ad featuring its specialty. The smart watch too is water resistant and has much functionality that is related to health and time management. Many new inclusions have been made when compared to its predecessor models. Health tips and task assigning software is included in the gadget. 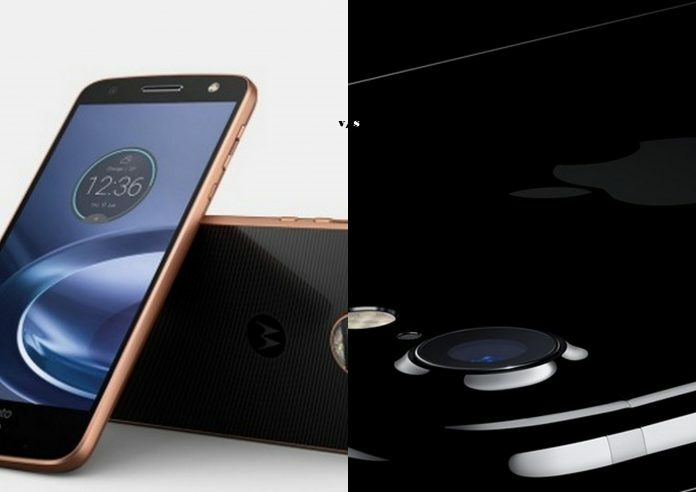 In this segment of smartphones, Moto Z-Droid edition can be said to be the competitors for Apple. They are carrying the reputation of the world’s thinnest phones at present. The durable and ultra-thin design makes them a tough competitor for iPhone. Moto Z-Droid series phones are packed with a bundle of advanced features and specifications. Hence, the buyers have a choice to get the best with the budget almost tagging the same for the two.